Information society projects promise wealth and better services to those countries which digitise and encourage the consumer and citizen to participate. As paper recedes into the background and digital data becomes the primary resource in the information society, what does this mean for privacy? Can there be privacy when every communication made through ever-developing ubiquitous devices is recorded? Data protection legislation developed as a reply to large scale centralised databases which contained incorrect data and where data controllers denied access and refused to remedy information flaws. Some decades later the technical world is very different one, and whilst data protection remains important, the cries for more privacy-oriented regulation in commerce and eGov continue to rise. What factors should underpin the creation of new means of regulation? 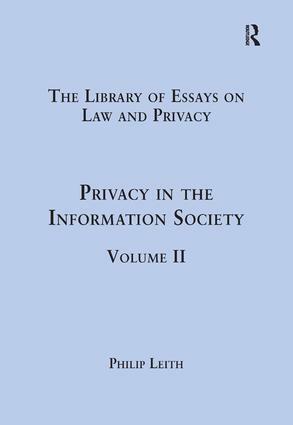 The papers in this collection have been drawn together to develop the positive and negative effects upon the information society which privacy regulation implies. Contents: Introduction. Part I Privacy Generally: An examination of the concern for information privacy in the New Zealand regulatory context, Ellen A. Rose; Property rights in personal information: an economic defense of privacy, Richard S. Murphy; Privacy and security concerns as major barriers for e-commerce: a survey study, Godwin J. Udo; Privacy by design - principles of privacy-aware ubiquitous systems, Marc Langheinrich; The problem of anonymous vanity searches, Christopher Soghoian. Part II Data Protection and Commerce: EU data protection policy. The privacy fallacy: adverse effects of Europe's data protection policy in an information-driven economy, Lucas Bergkamp; Information technology, marketing practice, and consumer privacy: ethical issues, Ellen R. Foxman and Paula Kilcoyne; Consent in data protection law: privacy, fair processing and confidentiality, Roger Brownsword; The Data Protection Directive 95/46/EC: idealisms and realisms, Rebecca Wong; Behavioral advertising: the cryptic hunter and gatherer of the internet, Joanna Penn; Privacy and confidentiality in an e-commerce world: data mining, data warehousing, matching and disclosure limitation, Stephen E. Fienberg; Safe harbor - a framework that works, Damon Greer; The 'final' privacy frontier? Regulating trans-border data flows, Gehan Gunasekara; To track or not to track: recent legislative proposals to protect consumer privacy, Molly Jennings. Part III Biometrics: Biometrics: privacy's foe or privacy's friend?, John D. Woodward; Privacy issues in the application of biometrics: a European perspective, Marek Rejman-Greene; Biometrics and privacy: a note on the politics of theorizing technology, Irma van der Ploeg; Biometric technologies in support of identity and privacy assurance, Colin Soutar; Privacy law: biometrics and privacy, Jan Grijpink. Part IV The Cloud: Security and privacy implications of cloud computing - lost in the cloud, Vassilka Tchifilionova; Privacy and consumer risks in cloud computing, Dan Svantesson and Roger Clarke; Digital evidence in cloud computing systems, M. Taylor, J. Haggerty, D. Gresty and R. Hegarty; Caught in the clouds: the web 2.0, cloud computing, and privacy?, Paul Lanois. Part V Geo-Location: Re-mapping privacy law: how the Google Maps scandal requires tort law reform, Lindsey A. Strachan; E-commerce tax: how the taxman brought geography to the 'borderless' internet, Dan Jerker B. Svantesson; Tweets from Justin Bieber's heart: the dynamics of the 'location' field in user profiles, Brent Hecht, Lichan Hong, Bongwon Suh and Ed H. Chi. Part VI Social Networks: Teens, privacy and online social networks: how teens manage their online identities and personal information in the age of MySpace, Amanda Lenhart and Mary Madden; Publicly private and privately public: social networking on YouTube, Patricia G. Lange; Employer's use of social networking sites: a socially irresponsible practice, Leigh A. Clark and Sherry J. Roberts; Social networking websites - a concatenation of impersonation, denigration, sexual aggressive solicitation, cyber-bullying or happy slapping videos, Bruce L. Mann. Part VII Health Care: Impact of news of celebrity illness on breast cancer screening: Kylie Minogue's breast cancer diagnosis, Simon Chapman, Kim McLeod, Melanie Wakefield and Simon Holding; Privacy, information technology, and health care, Thomas C. Rindfleisch; 'Iceland Inc.'? : On the ethics of commercial population genomics, Jon F. Merz, Glenn E. McGee and Pamela Sankar; Geocoding in cancer research: a review, Gerard Rushton, Marc P. Armstrong, Josephine Gittler, Barry R. Greene, Claire E. Pavlik, Michele M. West and Dale L. Zimmerman. Name index. Philip Leith is Professor of Law at Queen's University of Belfast, UK.